As drizzle fell on a damp fall afternoon, the No. 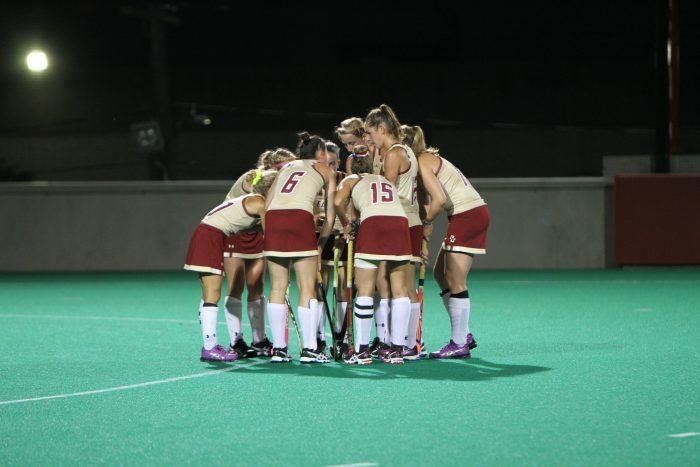 8 Boston College field hockey team took on No. 16 Wake Forest at the Newton Campus. Both teams, having weathered tough ACC conference games, were hungry for a league win. With high intensity and energy right off the bat, it was evident that it was going to be a hard fought game. The Demon Deacons battled the hardest and beat the Eagles 4-3 with a golden goal in overtime play. When the starting whistle blew, BC flew out of the gates and maintained possession as they pressed Wake’s defense. Ten minutes into the game, the Eagles were rewarded for their industrious work and received an attack penalty corner. Emily Plasteras passed the ball to Eryn McCoy who was able to find the back of the goal and send the Eagles up one. With 13 minutes remaining in the half, the Demon Deacons’ Jess Newark was carded, giving BC a one-player advantage. This did not discourage Wake, however. Thirty seconds later, Anna Kozniuk scored, tying the game, and giving Wake a burst of energy. Their pressure paid off when Krysta Wangerin scored, giving the Demon Deacons a 1-2 advantage going into halftime. The fight continued when the second half began. Girls were diving for steals and dangerous high balls were flying. Neither team was able to break through the other’s defense for the first 13 minutes, until Tyra Clemmenson netted a ball. This increased her team’s lead by two and caused BC to call a timeout. Two minutes later, Wake’s Emily Conroe received a green card, giving the Eagles another one-player advantage. BC head coach Ainslee Lamb decided to pull the goalie and replace her with a kickback, giving her team the ability to apply more pressure on Wake’s defense. “We pulled the goalie with about six minutes left so it definitely put some wind in their sails and they really went after it,” Lamb said. The 11-on-9 setup paid off when Emily McCoy was able to score an attack penalty corner goal to bring the team within one. This goal gave the Eagles the hope and energy they needed. With the goalie still out and the kickback in place, Kelcie Hromisin was able to tie the game with the assistance of AshLeigh Sebia. BC converted its only two shots on goal in the second half to send the game into overtime tied at 3-3. “To have the opportunity to score the first goal was exciting, but then to stay committed to it and score the second goal was fantastic,” Lamb said. Wake won the coin toss and received possession first. With each team having seven players on the field and 15 minutes on the clock, the sudden-death overtime began. The change in mentality was apparent. Both teams slowed the pace and worked on careful passes, knowing that one mistake could cost the game. Five minutes into overtime, an injury timeout for BC’s Brittany Sheenan changed both team’s mentalities. When play resumed, the Eagles and Demon Deacons picked up speed and increased their aggression. Three minutes later, Wake’s Kozniuk scored her second goal of the game with a powerful drive from the top of the circle clinching the game. Even after a disappointing loss, the Eagles are focusing on the positives. They were able to successfully use the kickback and score two goals off attack penalty corners, and they did not give up any defensive penalty corners. Lamb commended the competitive nature of conference after the game.